Herbert Bayer: Mountains and Convolutions, 1944 – 1953, an exhibition featuring 28 of the artist’s most dynamic compositions, was presented in the Resnick Gallery in the Doerr-Hosier Building at the Aspen Institute from June 14, 2018 to June 10, 2019. 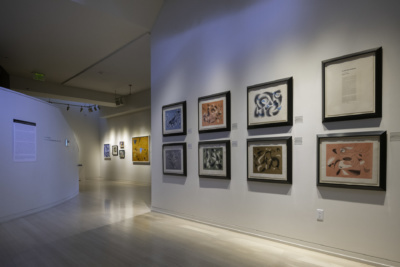 Organized by Bernard Jazzar, a leading authority on the work of this influential, Austrian-born artist, the exhibition focuses on a rich body of work Bayer produced during a seminal period in his career. Painting his landscapes in the years following the upheavals and dislocations of World War II, Bayer sought solace and inspiration in nature. 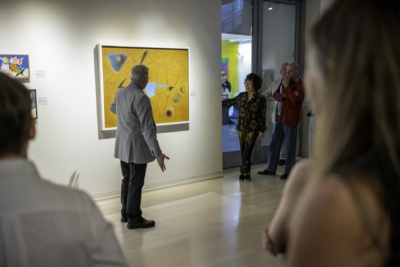 In his abstracted compositions, subjects range from the snow-covered peaks of Vermont to the mountains surrounding his home in Aspen where he moved in 1946. The exhibition also includes related paintings he did while visiting Mexico. Loans to Mountains and Convolutions include several never-before-exhibited landscapes from private collections as well as from the Denver Art Museum. An illustrated publication with an essay by Bernard Jazzar accompanies the exhibition. The exhibition is free and open to the public. Born in Austria, Herbert Bayer (1900 – 1985) moved to the United States in 1938 to escape the Nazi regime. Settling in New York, he established himself as an exhibition designer and graphic artist. In addition to organizing several influential exhibitions for the Museum of Modern Art, he designed numerous magazine covers, books, and advertisements for individuals and corporations. Throughout this period he also continued to pursue his foremost artistic interest, painting. As an exile in New York, Bayer frequently dreamed of returning to his home in Europe. However, this was not to be. Nonetheless, accepting that his destiny was to remain in New York proved challenging. Born and raised in a small Alpine village near Linz, Austria, Bayer struggled with living in an urban environment and regularly sought opportunities to leave the city. His initial refuge was Stowe, Vermont, where he skied in the winter. 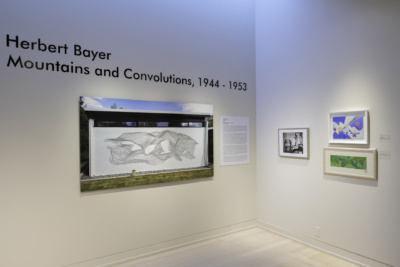 In 1944, during one of his trips to Stowe, Bayer was intrigued with the topography of an isolated rural area and began to produce landscapes. 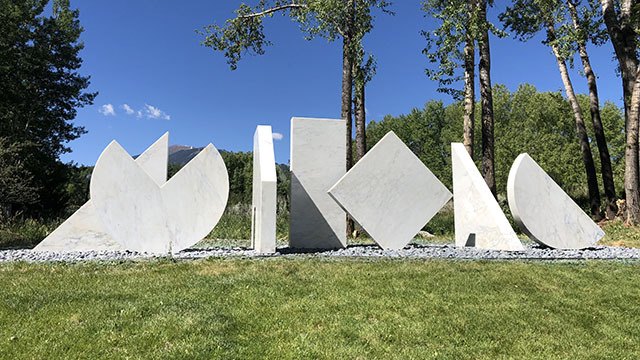 However, rather than depicting the mountains in a realistic manner, Bayer created a dramatically undulating abstraction inspired by the area’s geological formations and its dynamic transformation over time. He eventually titled this series Mountains and Convolutions. He continued to explore the theme for the next decade. Bayer made his first trip to Aspen in 1945. 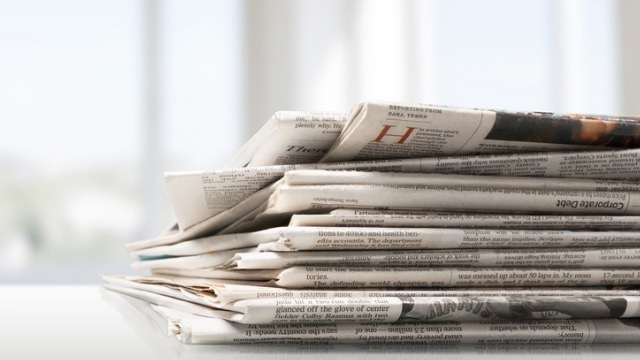 He moved there permanently the following year at the urging of Walter Paepcke, president of the Container Corporation of America and founder of the Aspen Institute for Humanistic Studies. Aspen offered an ideal setting in which Bayer continued the artistic explorations he had begun in Vermont. Viewing the mountains from the perspective of an adult, he recognized their importance to him as an artist. In his new home, he also achieved a balance between his day-to-day life and his work as an artist. 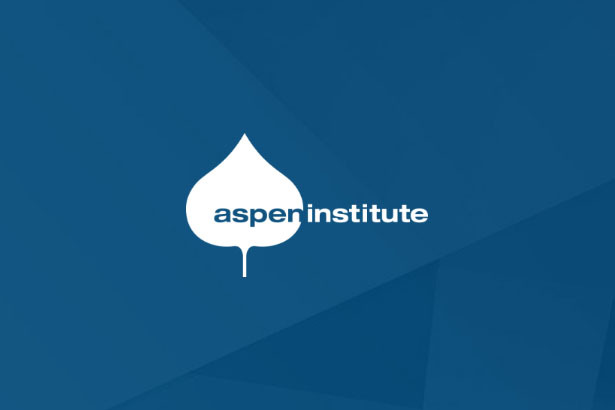 Hebert Bayer: Mountains and Convolutions is the third focus exhibition to be presented at the Aspen Institute. This body of work, created between 1944 and 1953, reflects the joy Bayer felt at returning to a familiar setting, an environment similar to the one in which he had grown up. The exhibition reveals the artist’s unique approach to landscape, particularly the landscape surrounding his home in Aspen, which he pursued through his formalist sensibilities and with an abiding passion for painting.